When people ask me what I do, I often respond, “I do a lot if things; I'm an entrepreneur.” I'm very happy to have earned that title. I'm no longer just a freelance web designer, just a podcaster, just a consultant, or just one anything. I am an entrepreneur! As such, I get excited when I see kids learning to be entrepreneurs, and I've decided to support them. 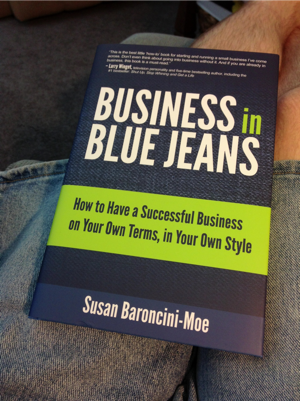 Susan was very generous and gave copies of her book, Business in Blue Jeans, to all attendees. Her session and her book both start with her story of starting a Kool-Aid stand in order to fund her love of bubblegum. I hadn't even made it past the preface before being inspired (I still have the book in my lap while I write this). The world needs more entrepreneurs, and children who attempt entrepreneurship at a young age are audacious and probably the next generation of business leaders and creative thinkers. This next generation needs to know that success isn't just the product of hard work, but it's the product of smart work. If they see early on the relative “wealth” they can earn from a good idea, this will be a major life lesson that will point them toward success in their future. For this reason, I've decided to try supporting these child-entrepreneurs. It may only cost me a $1 or 25¢, but I could be inspiring someone who will generate millions in the future and provide jobs to many others. Will you join me in supporting these entrepreneurs?